Even though Labor day has come and gone, you can still grill. We do it most weekends here in NC, all year long. 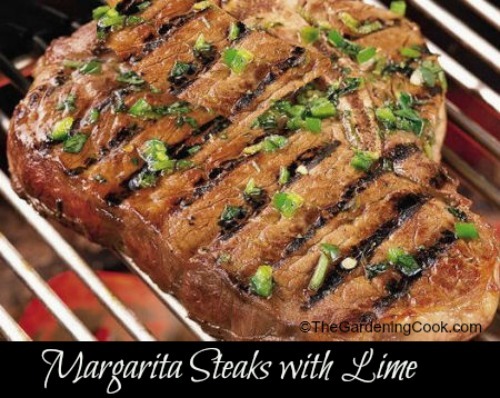 These Margarita steaks will be perfect for the barbeque. Cook up these Margarita steaks for your next BBQ. My husband is the grill master at our house, but he counts on me to come up with something to season or marinate the meat before he puts it on the grill. The recipe calls for steaks marinated in tequila, jalapeño chili peppers and lime for a great Mexican inspired kick. Sugar adds just a touch of sweetness to complete the seasonings. Cilantro adds a nice spicy kick to the recipe and it is very easy to grow as long as it doesn’t get too much heat. See my tips for growing cilantro here. For more great recipes, please visit The Gardening Cook on Facebook. And what Margarita steak would be complete without the classic margarita to go along with it? Get the recipe here. These Margarita steaks will be perfect for the barbecue. They have a delicious flavor of tequila, lime and cilantro. Combine all ingredients except steaks in a shallow baking dish; mix well. Add the steaks and turn to coat. Cover and refrigerate at least 4 hours to marinate, turning steaks once. Heat the grill. Remove steaks from marinade; reserve marinade. Place steaks on gas grill over medium heat or on charcoal grill 4 to 6 inches from medium coals. Cook 10 to 15 minutes or until steaks are as you like them, turning once and brushing occasionally with marinade. Discard any remaining marinade.